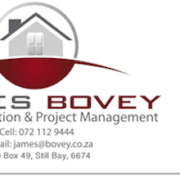 Building Contractors and Project Managers offering the full spectrum of construction services in Still Bay. A popular coastal town in the Hessequa area, Western Cape along the Garden Route with its unique fynbos and other flora. Barrett J Construction & Project Management offers specialised management services of any building project. In essence their services include the building of new residential homes, alterations and additions, garages, cupboards as well as general contracting projects. Of course they make use of subcontractors for structural, electrical, mechanical, plumbing as well as other specialty work. Jeffrey Barrett has been in the home building business for more than 40 years during which time he has completed a variety of building projects. His company is known for its integrity, innovation and expertise, as well as the high standards of workmanship and personalised customer care. They are service driven and it is important to them to stay within the budget as well as to deliver quality work within the set time-frame as far as possible. This company is, of course NHBRC accredited. (National Home Builders Registration Council) builders in Stilbaai, Jongensfontein and throughout the Hessequa region. Barrett J Construction & Project Management has a hands-on approach to project management. They offer expert, specialised project management of any new residential buildings such as houses, town-houses and apartments. Also cottages, condominiums, single units as well as subdivisions of which designs generally are done by architects and engineers. They see to all the aspects needed to complete the building from laying the foundations, bricklaying, flooring, as well as roofing and guttering. Also plastering, painting, electricity, plumbing, tiling, installing windows and hanging doors as well as built-in cupboards, etc. Likewise they see to the exterior finishes such as paving, garden walls, garage doors, security fencing and water tanks, etc. In addition they will make sure that all building rubble has been removed from the property. Once the project is completed, they hand you the key and you can to move in. Renovations, remodelling, additions or alterations can include a variety of projects, each of course offering different challenges. Projects such as remodelling the kitchen or bathroom, adding energy efficient windows, or insulation or a solar powered geyser. Change the flooring from carpets to tiles, redo all existing tiling on wall and floors, painting indoors as well as outdoors including the roof. Pull down existing ceilings and replace with beautiful modern lightweight ceilings. At the same time replace lighting with better energy efficient lighting. Home alterations like adding a bathroom, another room, a second storey or a new wing. Or even change the internal configuration of rooms, build a lapa, a carport, a deck, or enclose a patio or balcony. Build a swimming pool or any other basic updates which will add value to your property. You might want to completely overhaul an old house replacing all outdated energy-wasting as well as water-wasting features with modern developments. Alterations are typically done to improve the nature of the use of the building. Whatever you are planning on doing, make sure that you do have the approval of the municipality wherever necessary. In coastal areas such as Still Bay it is important to have a garage where your vehicle can be secured against rust. Barrett J Construction & Project Management will gladly handle the construction of your garage. Whether you need a single, double, or even triple garage attached to the house or as a separate outbuilding, they will build it for you. There are, of course different types of garage doors to choose from. Doors may swing out, swing up, roll up or slide to the side. They will handle all aspects of the project such as the flooring of your choice and the painting of the building. Also the installation of the electrical mechanism which automatically open and close the door by remote control. Should you want any shelving or cupboards added for storage or for your tools, they will also take care of that. You might have a double or triple garage and want to build a little apartment on top to rent out to holiday makers… just a thought! As general contractor, this company manages the day-to-day activities at the job site and is in charge of the actual building of the building. This company does not handle mechanical work such as heating and cooling or electrical work such as wiring and lighting. 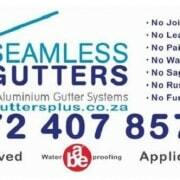 Nor do they perform structural work or plumbing/pipework or drainage/sewerage systems. They make use of various specialty subcontractors for any work they cannot manage themselves. Their job is to manage the project by coordinating the work of the subcontractors as well as serve as liaison in communicating with the architect or owner. They are, of course fully driven to keep the project within the time-frame as well as the budget, while still delivering the highest quality of work. Barrett J Construction & Project Management can also assist with the conceptual design and installation of cupboards in new homes as well as renovated areas. The possibilities for built-in cupboards are many such as kitchens, bedrooms, dining rooms, offices, bathrooms, storerooms and garages. These could be in the form of wardrobes, display units, full-wall units, cabinets as well as vanities. Also shelving units and the built-in bar in you man cave or the built-in braai area in your lapa. 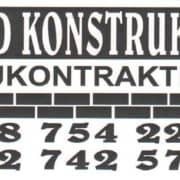 Boukontrakteurs en Projekbestuurders in Stilbaai bied jou die volle spektrum van konstruksiedienste. Barrett Bouers gespesialiseerde bestuursdiente sluit in nuwe huise, aanbouings en verbeterings, motorhuise, kaste en so ook algemene kontraktering van projekte. Hierdie bouers of boukontrakteurs is al langer as 40 jaar bedrywig in die boubedryf. Dit is bekend vir integriteit, kundigheid en so ook kwaliteit vakmanskap. Hulle streef daarna om ‘n projek binne die begroting en so ook teen die sperdatum af te handel. 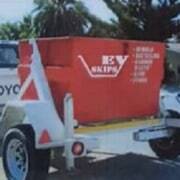 Verder is hulle geakkrediteer NHBRC bouers in Stilbaai en Jongensfontein. Hulle bestuur nuwe huisbouprojekte soos huise, woonstelle, kothuise, kondiminiums, enkel eenhede, onderverdelings, en so meer. Hulle hanteer die projek van begin tot einde, van die fondamente, bouwerk, vloere, dakke en geute, pleistering en so ook verfwerk. Ook die vensters en deure, ingeboude kaste, elektriese bedrading , rioolstelsel en bepyping, plaveiwerk, watertenk, tuinmure, en so aan. Verbeterings aan jou bestaande huis of aanbouings kan baie verskillende dinge insluit. Van die oordoen van kombuise tot die aanbou van ‘n badkamer of kamer. Of die vervanging van bestaande teëls of so ook die verf van die huis, binne en buite. Ook die bou van ‘n dek, swembad of lapa. Of ‘n woonstel op die dubbelgarage, die toemaak van ‘n stoep of balkon, en nog so baie meer. Maak net seker dat jou planne nie teenstyding is met munisipale regulasies nie, of dat jou planne goedgekeur word. Aan die kus is dit noodsaaklik om jou motor in ‘n motorhuis te hou ander roes dit op. Jy kan dalk ‘n enkel, dubbel of self trippel motorhuis beplan met afstandbeheerde roldeure. Die motorhuis kan alleen staan of vas aan die bestaaande gebou beplan word. 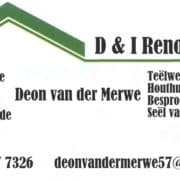 Wat jy ookal beplan in die lyn van ‘n huis vir jou voertuig of voertuie, Barrett J kan jou projek namens jou behartig en jou baie moeite en foute spaar. As algemene kontrakteur sien hulle om na die dag-tot-dag aktiwiteite op die bouperseel. Hulle maak ook gebruik van subkontrakteurs vir strukturele werk, loodgieterswerk en so ook elektriese werk. Asook meganiese werk en enige ander spesialiteitswerk wat hulle nie self kan doen nie. Hulle is die skakel tussen jou of die argitek en die bouers. 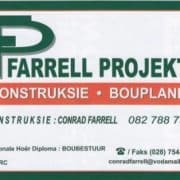 Verder kan Barrett J jou help met die konseptuele ontwerp en so ook installering van ingeboude kaste in nuwe huise en aangeboude of verbeterde areas. Kaste kan op baie plekke aangewend word soos in die kombuis, slaapkamer, badkamer, kantoor, stoorkamer en motorhuis, en so meer.